Sexta Etas Mundi. Folio CLXXXVII - SCHEDEL, H.
Title : Sexta Etas Mundi. Folio CLXXXVII. Size : 15.7 x 11.0 inches. / 40.0 x 28.0 cm. Description :A very fine genealogy of Carlo Magno (253x225 cm). RECTO: a medieval scene with musicians and Saint Willibrordus. 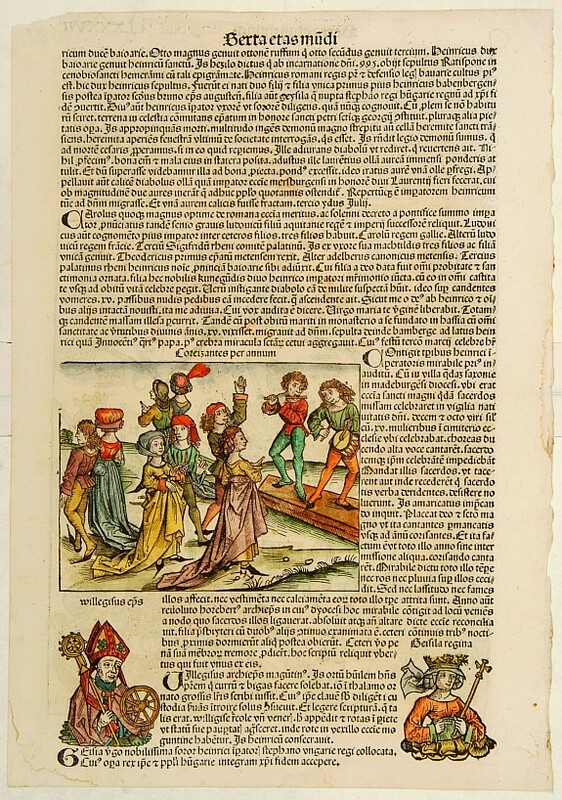 Page from the richest illustrated Incunable, the famous: Nuremberg Chronicle , published the year that Columbus returned to Europe after discovering America. An opportunity to acquire a 15th-century book illustration by named artists.! Condition : In good condition, wide margins and attractive colours.